snapped them up because I simply can't refuse a bargain! I used a little of this transfer on my goth girl's top - spot the yellow flower with a black centre...and put some tiny green clovers in her hair. 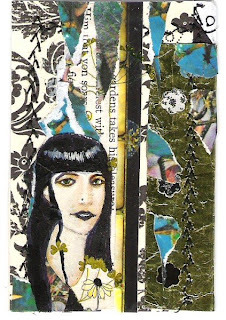 My goth girl is hand-painted by moi and the background upon which she sits is collage, embroidery and gold foil. 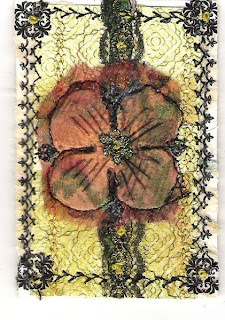 The other swap I've entered into is an embroidered atc swap. It was through Nick's Altered Art that I found out about this swap. One of her groupies posted a link and I just had to track it down. Anyway - this was a tricky little atc to start with. I backed the flower with one of Alicia's goodies from the mail-art swap I did with her a couple of weeks ago, then placed some gorgeous Japanese rice paper underneath it. Next, a gorgeous bit of lacey ribbon I got off my best mate (in the whole wide world), Flower. This I embroidered with french knots. Next, I stiched on a paper cut flower, embroidered over that with straight stitch, then covered it with dark pink organza - machine stitching all around the petals with black cotton. Then the black cotton border was embroidered on; rub-ons added; a couple more french knots and voila! One embroidered atc ready to swap. AND OHHHH I can't wait to see what I get in return!!! Corrine, fresh snow! Lovely! Winter must be upon us. We have snow on the Tararuas up here but not on the hills yet. Gypsy - you're back! Hope Jordan was a nice stay. Yes, there was Arabic from your story in there! I am NOT a goth lover but I love this card- great job and your artistic talents really amaze me!! The rennaissance flower is mrre my style- Am I A PRUDE????? Thanks for your ownderful kind comments about my bird post!! You have amazing birds in NZ- I wish that I could see some in their natural habitat!!! I guess that the birds are always better on the other side of the ocean!!!LOL!!! i love these -- you did a fabulous job, lady. i didn't realize when i saw the first one a few moments ago on he mixed media art ning that you hand painted her -- you rock! very well done indeed. Oh, I'm an old school Goth, Elizabeth. Lol! My complextion always lent itself nicely to the look. Not into any of this Emo stuff though - too try hard! Thanks for the praise re the embroidered ATC! Hard to beat yours though!! 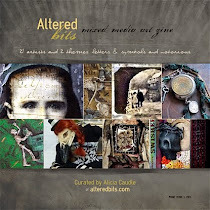 Thanks Arty-Em, Ali, and Altered Bits for your Goth praise. The embroidered card is just beautiful. I love how you describe each layer upon layer that you've added and describe the stitch work that you've used. It's a beautiful tapestry all its own! 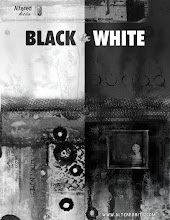 Thanks too for stopping by my blog! Wow Jill, thank you very much. I love to layer as much as possible. Gives it the sort of depth I'm always striving for. I was going to do a little bit of reverse applique to let the flower come through more but liked the effect of the organza over it in the end. I bet your excited ! She turned out beautifully! I just love the little clover peeking out of her ver goth tresses! Hello Marie - thanks for stopping on by! 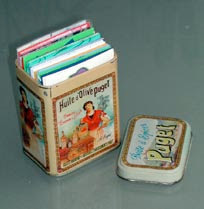 Just checked your site - wow, vintage postcards! Will stay in touch! !